Interactive streetscape design helps shape one of the state’s most iconic avenues. Developed from years of community feedback and visioning of the Michigan and Grand River avenues, "Shaping the Avenue" is a partnership between the municipalities of Lansing, East Lansing, and Lansing and Meridian Townships, the Capital Area Transportation Authority (CATA), and other organizations. With a Federal Transit Administration TOD Pilot Grant, a form-based code was crafted to unify the character of future private development and public street design along the avenues to create a more vibrant, pedestrian-friendly, and transit-oriented corridor. MKSK was part of a multi-firm project team to develop the form-based code, street, and streetscape design options. MKSK coordinated and facilitated a series of hands-on public workshops with a different focus for each community. Using an interactive kit-of-parts street design activity, community stakeholders and the public had the opportunity to share their feedback on street design options following an orientation on ‘best practice’ design. 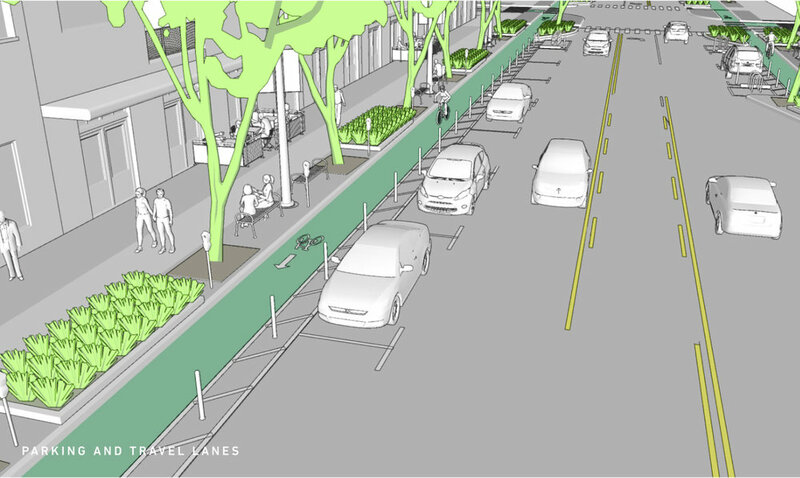 Participants could support the illustrated alternatives or build their own street design from scratch using streetscape components such as various sidewalk designs, protected bike lanes, medians, turn lanes, amenity zones, on-street parking, and transit lanes. MKSK also assisted with development of form-based code regulations to supplement or replace the current conventional zoning ordinance in each community along the corridor. Once adopted, the form-based code will provide each municipality with street design guidelines specifically tailored to the vision and needs of each community, while unifying the look and feel of future development along the Avenue from the state capitol through East Lansing to the Meridian Mall for years to come.